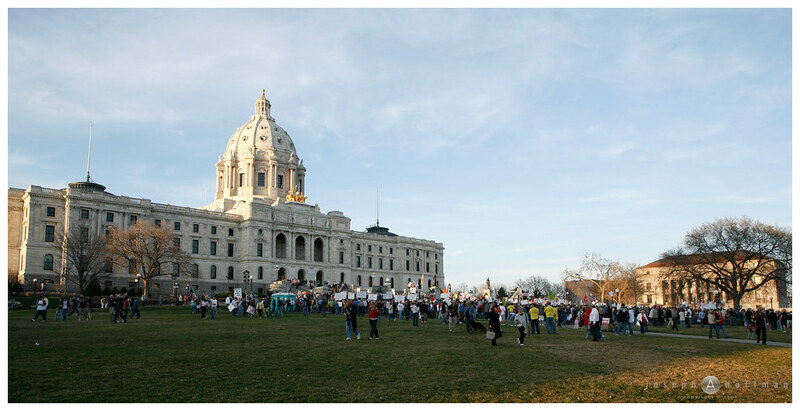 While the crowds didn't exactly pan out to be as large as expected, it looks like maybe 1,000 or so protesters turned up at Minnesota's state capitol in St. Paul yesterday for the tax day protest. What a joke. You obviously took that photo around 5 PM. By the time the event ended the sun was no longer that high in the sky. The crowd was massive and estimates were closer to 8 thousand. I would know. I was there. I agree with the person before me, this was taken around 4 right before it was scheduled to begin. I obviously offended the two anonymous commenters by stating my observations about the photo above showing what I thought to be about 1,000 protesters and the crowd being smaller than expected. Lighten up folks, and if you have a problem with the photo shown, please direct me to a quality photograph showing the crowd when more arrived and I'll gladly showcase it here.